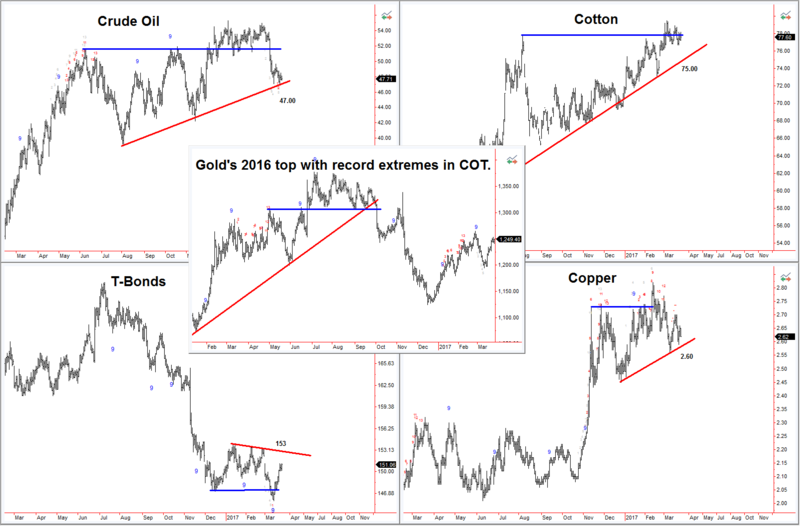 The Copper, Cotton and Crude Oil markets have recently registered COT numbers at multi-year extremes. The prices subsequently broke out to new highs, but failed to gain any traction. 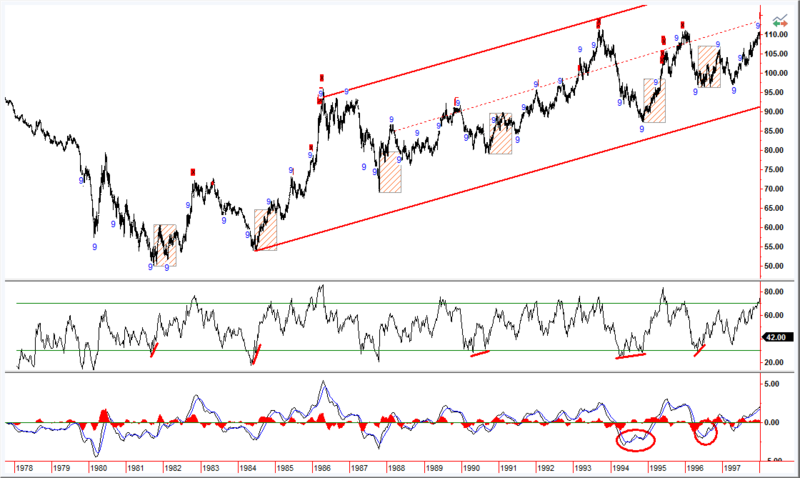 This is similar to what was seen in gold price last summer. A violation of the support lines will likely result in a domino of selling pressure. Conversely, the US Treasury market numbers are very bullish. The weekly bond chart (see following page) has a bullish divergence in the MACD and RSI. This comes after a downside Capitulation in December. 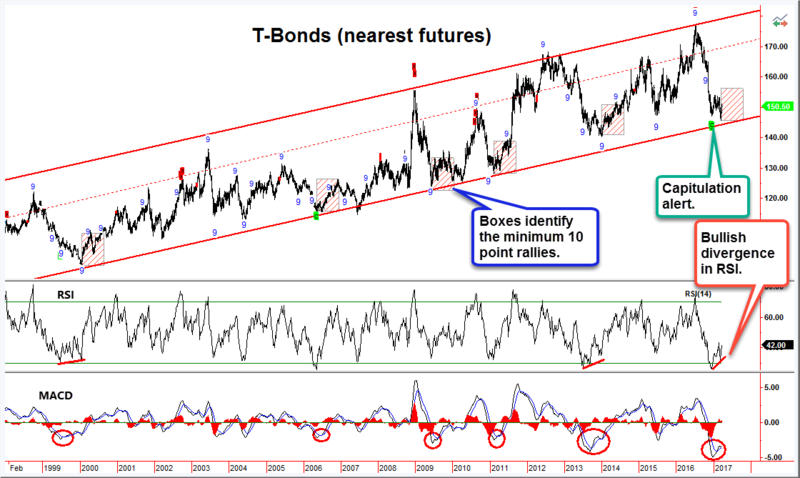 Note that each of the eleven times T-Bonds have been to the bottom of the 36-year channel the minimum rally has been 10 points ( ), providing a target of 156+ within the next two months. Investors should note that income from such securities, if any, may fluctuate and that each security’s price or value may rise or fall. Accordingly, investors may receive back less than originally invested. Past performance is not necessarily a guide to future performance. Neither the information nor any opinion expressed constitutes an offer to buy or sell any securities or options or futures contracts. Foreign currency rates of exchange may adversely affect the value, price or income of any security or related investment mentioned in this report. In addition, investors in securities such as ADRs, whose values are influenced by the currency of the underlying security, effectively assume currency risk. Moreover, from time to time, members of the Institutional Advisors team may be long or short positions discussed in our publications.